by the Pontifical Swiss Guard. Sophia Institute Press (Manchester, New Hampshire, 2018). During an era in which coffee-table books collect dust while handheld social media consumes idle time, there seems little need for another large hardback to join the lot on bookstore discount shelves. 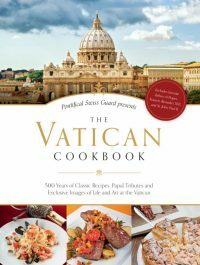 But “The Vatican Cookbook” stands out as an extraordinary and remarkable collection holding within its pages 500 years of recipes, history and photographs. An epic undertaking as both a tribute to and insight from the storied Pontifical Swiss Guard, “The Vatican Cookbook” is a culinary and artistic dream to lovers of food, history, culture and art. Trend-touting diet books and celebrity-created recipe collections can sit on those shelves, lamentable in comparison to the magnitude of this culinary endeavor. Recipes aside, readers will find themselves on a tour throughout this beautiful part of the world, seeing special sights and reading unique stories from contributors. Take a look into the annual May 6 swearing-in ceremony of the Swiss Guard, hear about a jovial personal encounter between a guard and the pope during overnight duty, and discover St. John Paul II’s unrelenting request while recovering from his assassination attempt. But don’t be discouraged, other than this being a source for the hungry and curious historian, there are a few simple dishes, such as eggplant mozzarella and chocolate gingerbread. And, because of the book’s photography and text, the book need not serve as primarily as a cookbook. Feeling indulgent after all that rich risotto with smoked eel followed by the sweet Christmas pastry “grittibanze”? Consider joining the Swiss Guards in taking action to end global hunger as they turn the reader’s attention to the need to support the most vulnerable among us. The authors invite readers to enjoy all the culinary treats the Vatican has to offer, but to also contribute to the Caritas Internationalis program, One Human Family, Food For All. Lordan has master’s degrees in education and political science and is a former assistant international editor of Catholic News Service. She is a digital editor at Peanut Butter & Grace, an online resource for Catholic family catechesis.